Hofmeister Custom Shop is a gunsmithing shop that specializes in building custom rifles and handguns. We also offer complete gunsmithing services, from repair to refinishing. This is a basic overview of our prices and services. The following services can be added to a custom firearm or performed on your factory guns. Hofmeister Custom Shop looks forward to providing the finest gunsmithing services for all your needs. The service list below is not all inclusive; please contact us and we can work with you to perform whatever service best fits your needs. True receiver face and lap in bolt lugs. True receiver face, lug seats, remachine bolt lugs, true bolt head and face, lap in bolt. In addition to Level 2, recut receiver threads concentric to bore. In addition to Level 3, bore receiver boltway true to bore and fit oversize bolt body. Please call for pricing on all blueprinting packages. Note: Octagon work includes polishing to 120 grit. Call for pricing on barrels with integral front sight bases, quarter rips, and sling swivel studs. We build complete custom stocks to order. This is just a glimpse of the pistol and revolver work we do! 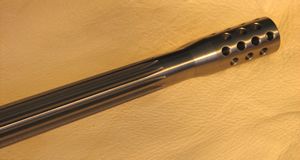 For custom barreling check out the custom handguns page. As a service to our customers we provide metal finishes from Robar. They are the highest quality available. Prices below do not include polishing, disassembly, reassembly, or shipping.